A parfait is a simple dish consisting of layers of cream, fruits, and pastries like cookies. It is light, filling and can be made healthier. NOTE: The guide below was adopted from the chef’s page. I used yogurt instead which I sweetened with homemade syrup. You can use honey. Soak 1 teaspoon of chia seeds in 1 cup of yogurt, about 10 minutes. Then add raw sesame seeds and flaxseeds. Crush fresh strawberries using a spoon and a bowl. 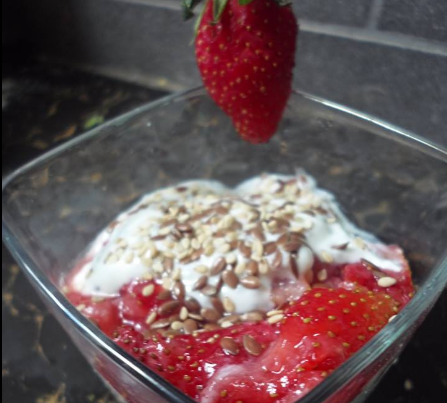 Place the crushed coconut cookies on the bottom, add the chia yogurt, the crushed strawberries and repeat. More to do with presentation but the dish has to be mixed up to consume. Call 0725793936 to get chia seeds, free delivery Nairobi CBD, Ksh 1000 per KG.